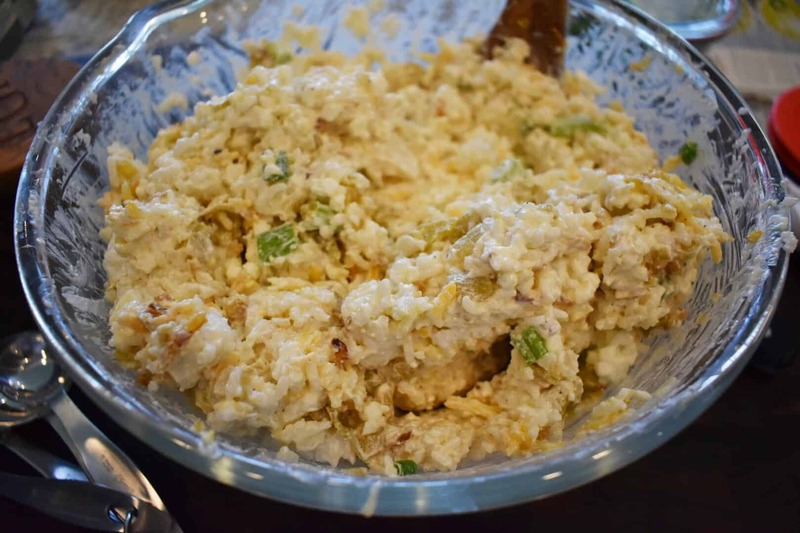 There aren’t a ton of recipes I have that I can say are “family recipes” in the sense that they’ve been passed from generation to generation. THIS, however, is one of those recipes. My Grandma Lou made this when she’d host our family at my grandparents’ home in Albuquerque, New Mexico. She and my Grandpa actually lived in a sort of ‘village’ in Albuquerque called Corrales. Hence the name: Corrales Casserole. 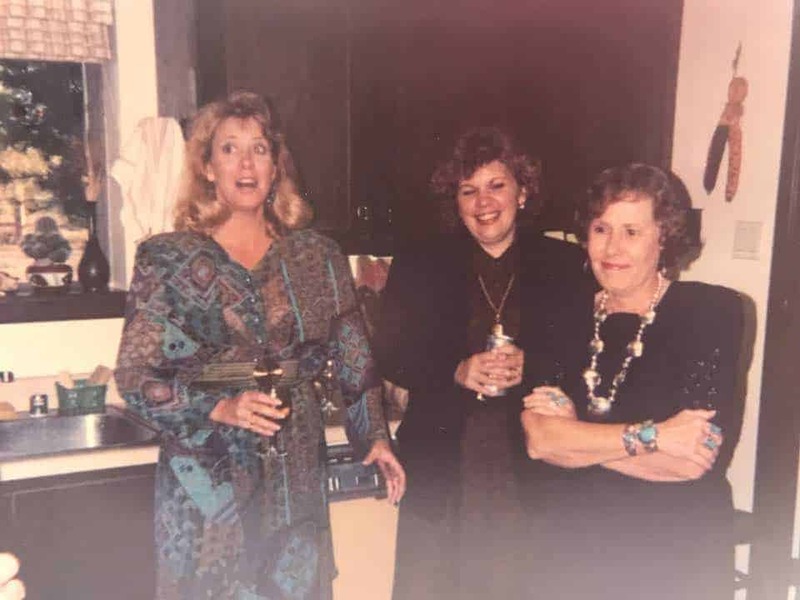 I love this picture: My Aunt Lynn (pronounced with a Texas accent – Annttt Liiinnn), my Momma, and my Grandma. This was taken in my Grandparents’ kitchen the night before my Anntt Liiinnn married her hubby. Their expressions make me laugh and take me back to that gorgeous house filled with so many memories. You can’t make anything in New Mexico without chiles – red or green – or “Christmas” if you get both red + green. While I LOOOOOOVE me some fresh green chiles (they freeze really well, too), we don’t always get those here in Texas. 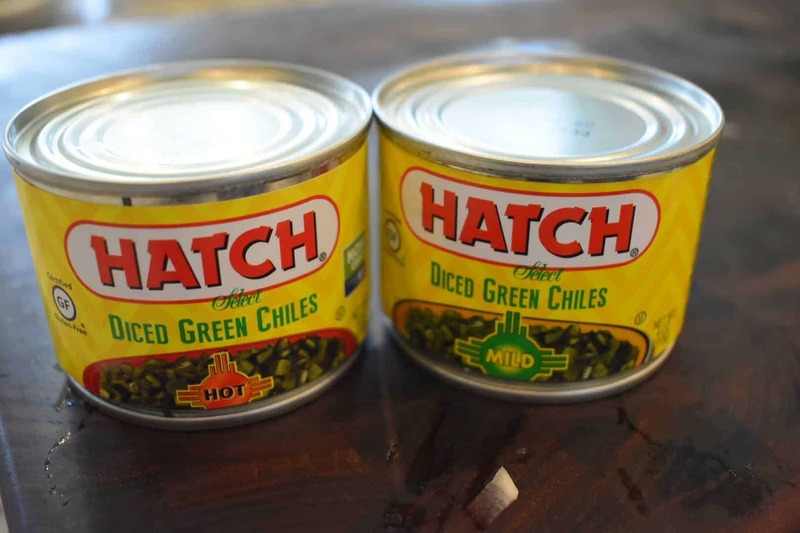 So, I have a go-to brand that I use when I need to have green or red chiles: Hatch. The great thing about the chiles is you can get them as mild or hot as you want. We tend to go with a blend (my Pitcher family are shaking their heads at me for not going full-on hot), but you can do whatever you’d like! This recipe is super simple, cheesy, comforting, and perfect to pair with so, so many things. We love it with flank steaks on the grill, grilled chicken, and even burgers. 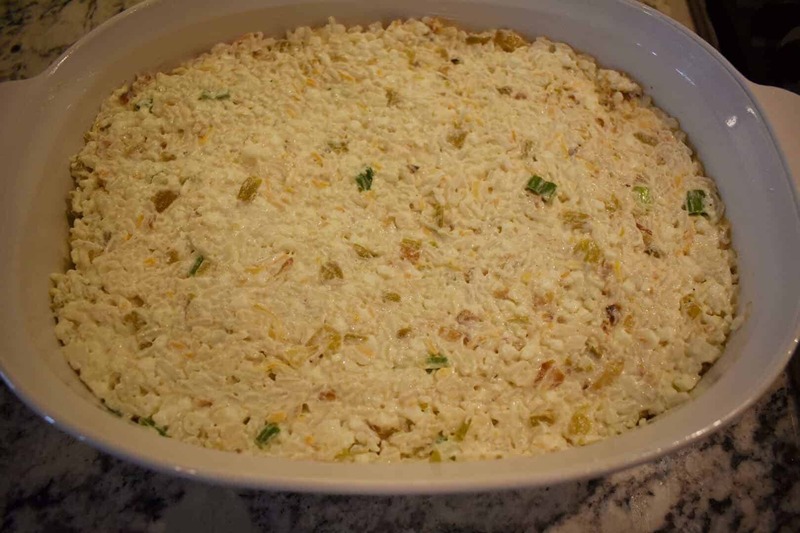 This is best done the day before so the rice is cool and easy to crumble. 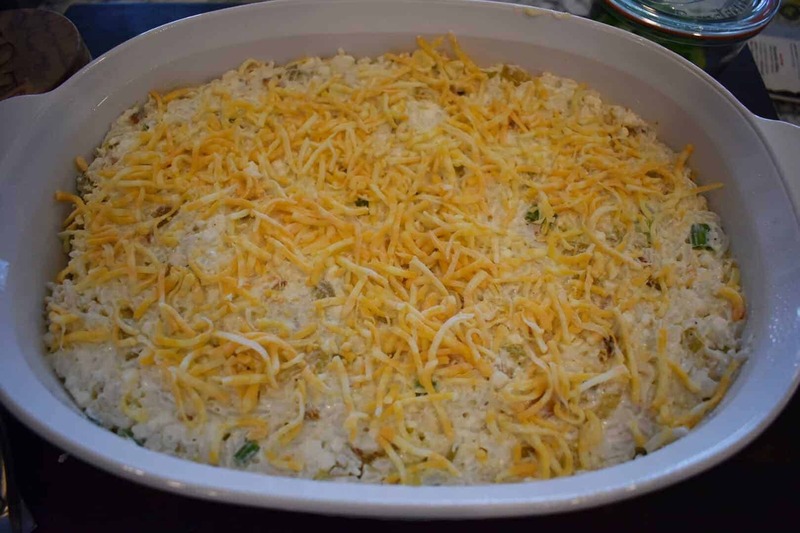 Just store in a covered container in the fridge up to four days before assembling the casserole. Sauté 1 diced white onion in 4 tbs. unsalted butter over medium-high heat. Once the onions are cooked (about 8 minutes), toss in some chopped canned green chiles with their juices (or the real stuff if you can get your mits on it). Sauté another 5 minutes. 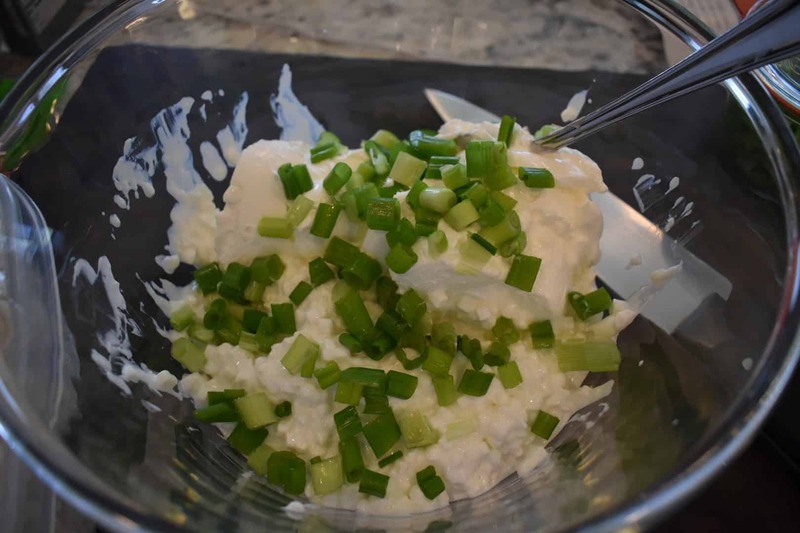 Combine everything in a large bowl: cooked rice, onion + chiles, Colby Jack cheese, cottage cheese, sour cream, green onion, and a little Kosher salt + black pepper. When I say large bowl, I mean a LAARRGGGEE bowl. This is a lot of New Mexican goodness, and you’re gonna need room to stir, my friend. Spray an oven-proof dish with cooking spray. 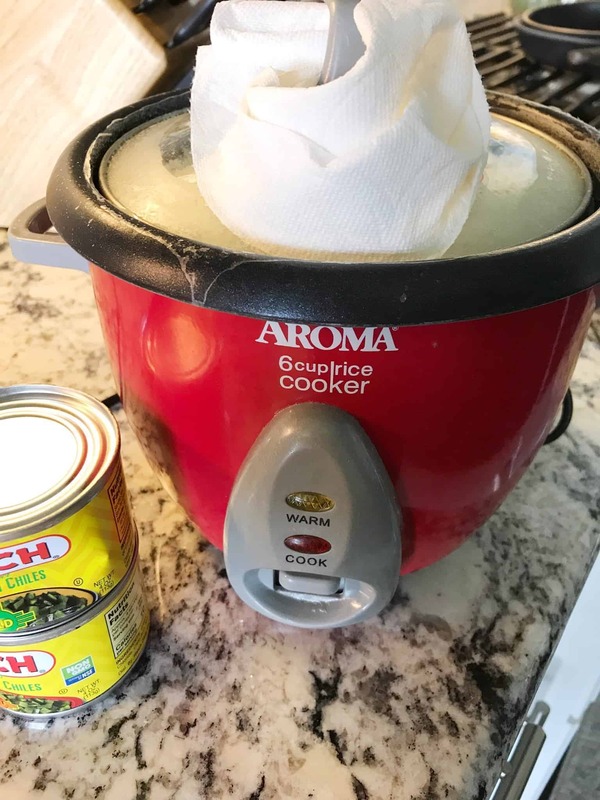 Dump everything in and smooth out the top. Bake at 375 for 25-30 minutes until cheese is gold and bubbly. Garnish with more green onion. The recipe below makes enough to feed a large group of folks. If you’re making it for 4 or so people, just cut the recipe in half! 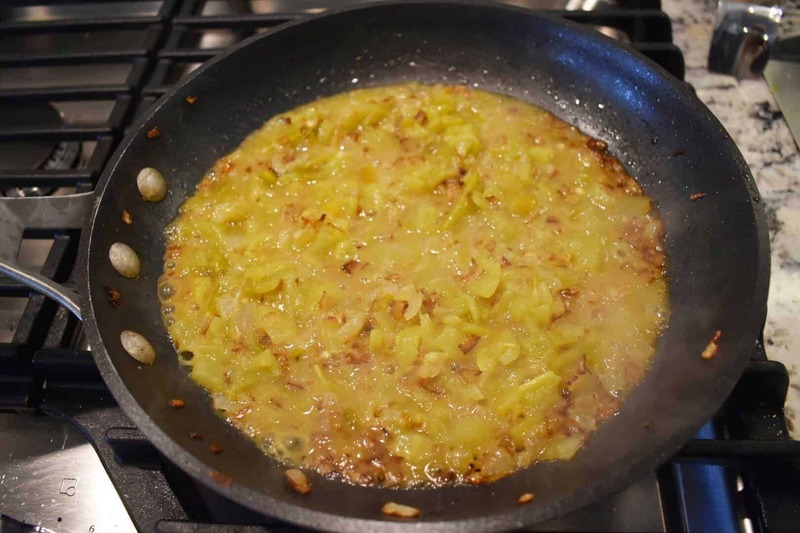 Melt the butter in a skillet over medium-high heat. 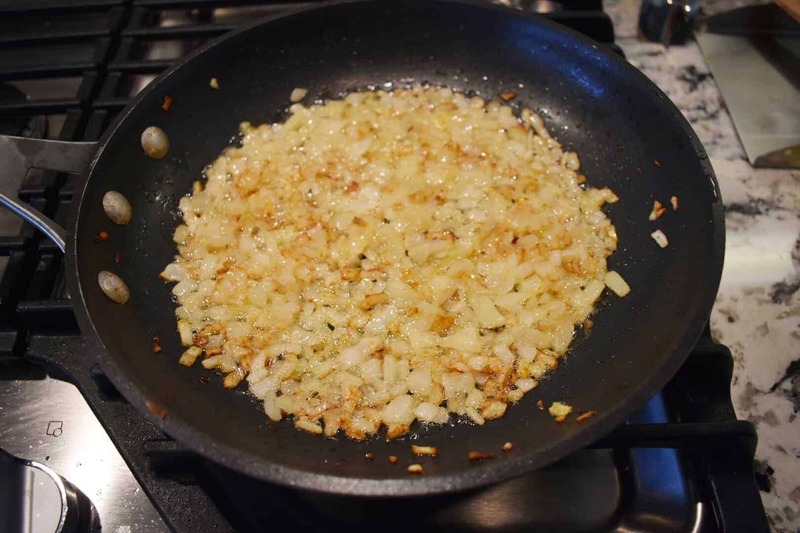 Add the white onion and sauté until onions are tender (about 8 minutes), stirring occasionally. Add the green chiles (including the juice) to the skillet. Stir and cook another 5 minutes. Remove from heat and allow to cool slightly. In a large bowl, break up the cooked rice with your hands so there are no large clumps. 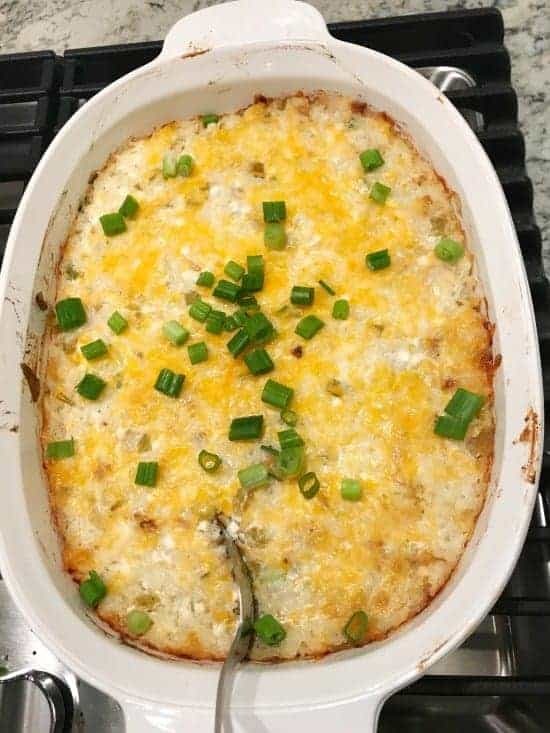 Add the onions + chiles, cottage cheese, sour cream, Kosher salt, freshly ground black pepper, 3/4 of the green onions, and 1 cup Colby Jack cheese. Stir to combine (use your hands if you need to). Bake, uncovered, at 375 for 30 minutes. Garnish with remaining green onions. 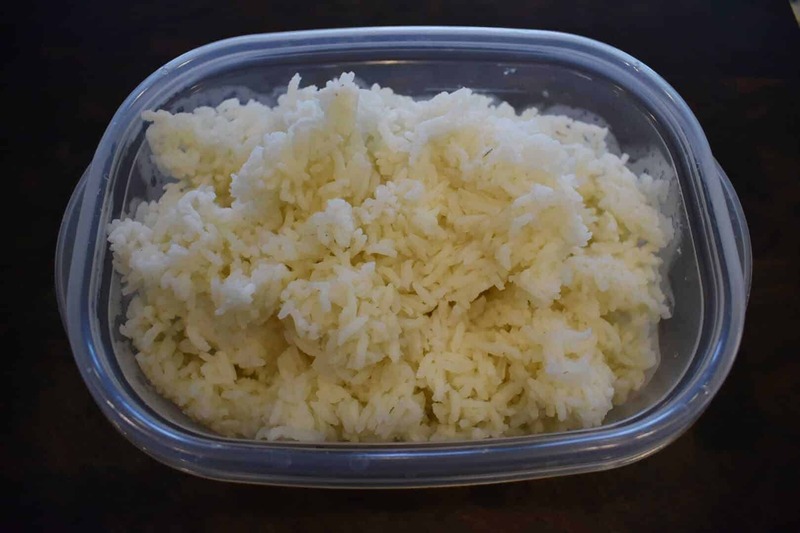 *Rice can be cooked and stored in an airtight container in the fridge for up to 2 days before making the casserole. 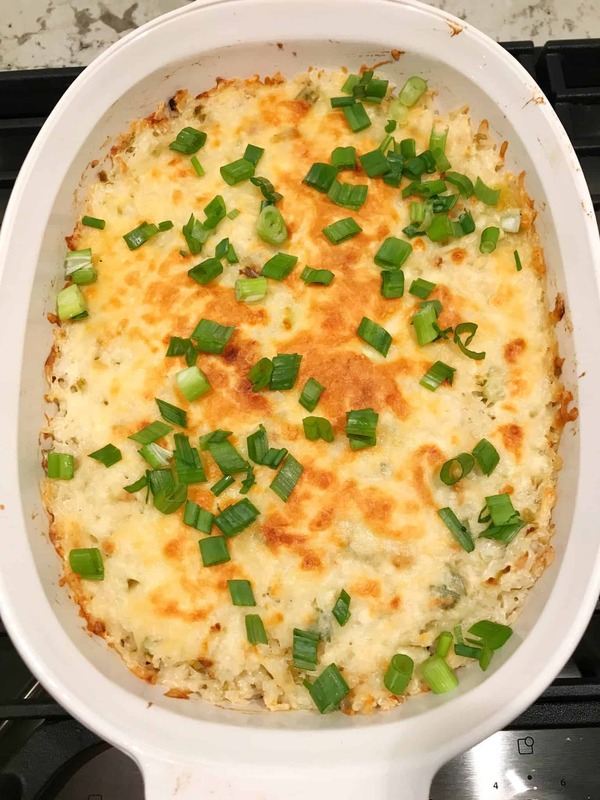 **Make ahead: At this point, you could cover the casserole and store in the fridge (up to 1 day ahead) until you’re ready to cook it. Remove it from the fridge about 20 minutes before baking, and bake as directed above. This sounds awesome! Just printed it out. And really? the squatty potty? really?